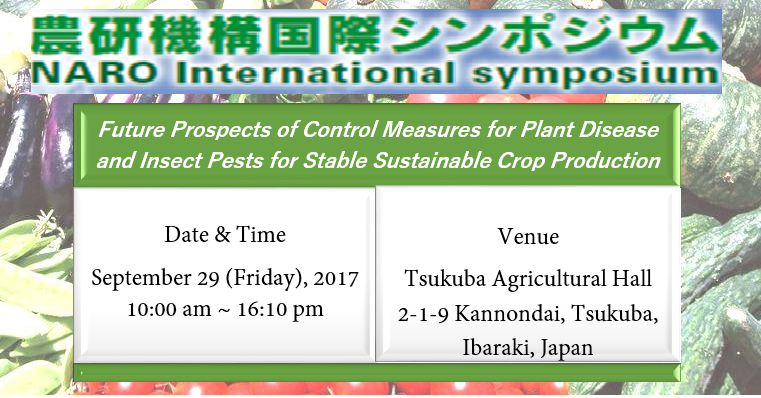 Future direction of development for plant control measures against pathogens and pests posing serious threats to crop production in fields will be discussed throughout the symposium. The most advanced research and control measures will be covered. The stable deployment of newly developed technologies to farm production will also be discussed. "Use of artificial ultrasounds for moth pest management"
"Biological control: Challenges and opportunities in a changing agricultural world"
"Global Food Security: Science, technology and social responsibility"
"Race differentiation of tomato fungal pathogen Cladosporium fulvum in Japan"
"Conservation biological control in field vegetable crops"
"Sustainable resistance in tomato and future management of the western flower thrips and tomato spotted wilt virus"
"Lessons from biotic and abiotic stress studies"